This book has been on my list for a very long time. Glad I bought it, because I absolutely loved it and plan to start using it this year. Mr. Coleman and his family run a CSA farm in Maine (USDA hardiness zone 5a, only one tick warmer than where I live in Minnesota), and they are able to deliver certain crops to their customers all year round with some pretty amazing techniques. We’re not talking about tomatoes here, but certain cold-hardy vegetables — greens, carrots, turnips — are actually superior in flavor during cold weather. Coleman breaks it down: the history of winter vegetable production, the maximum-yield yearly schedule, “cold” vs “cool” greenhouses, the basics of how he handles soil prep and pests, plus the very best cold weather vegetable varieties. This book is written with the small farmer in mind, not the home gardener. If I bought a farm tomorrow, I would use this book as a guide. But most if not all of his ideas are totally adaptable to the home garden, and actually will end up being more fun for me to experiment with since my livelihood will not be dependent on the results. 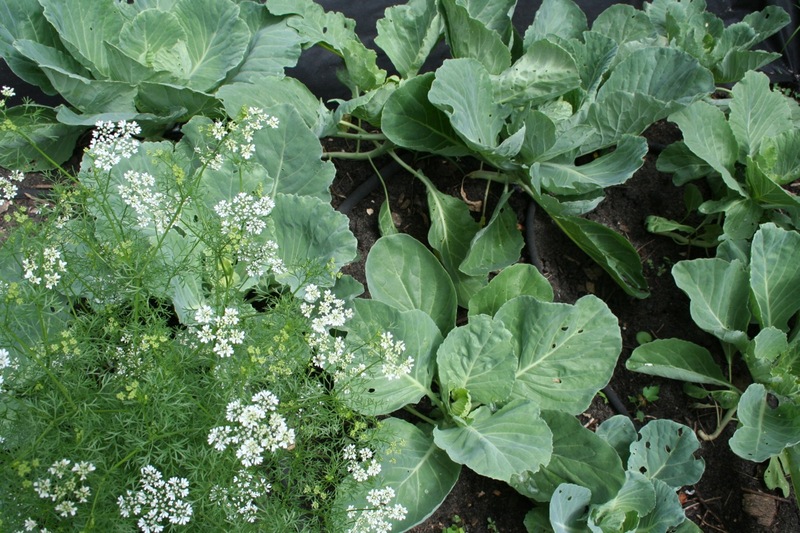 He also talks a bit about cold frames, which are very popular for small-scale winter vegetable production. They were not practical for his farm because of the volume of food they need to produce, but he got me thinking about where I might fit one in my yard. I can’t stress enough how useful this book would be, to me anyway, if I was starting a small CSA farm. He talks about tools, marketing, and growing vegetables that give you the most yield per square foot, and what’s worth your time or not, in terms of how successful he’s been in the past at selling various items. 1. I’m going to build wee hoop houses for my new stock tank gardens in the back yard and try for a late fall/early winter harvest of carrots and greens, using Coleman’s schedule and methodology. 2. I’m going to try his method for planting leeks. 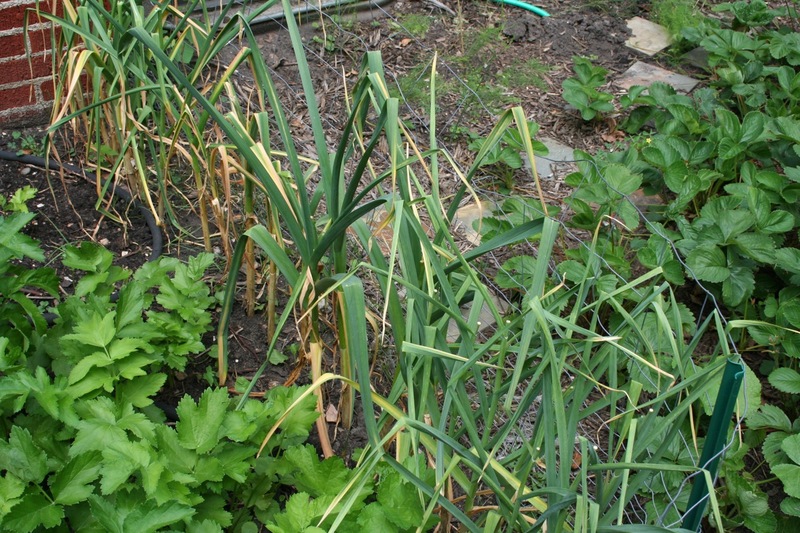 Most people hill up soil around their leeks as they grow, in order to get that nice blanched stem. 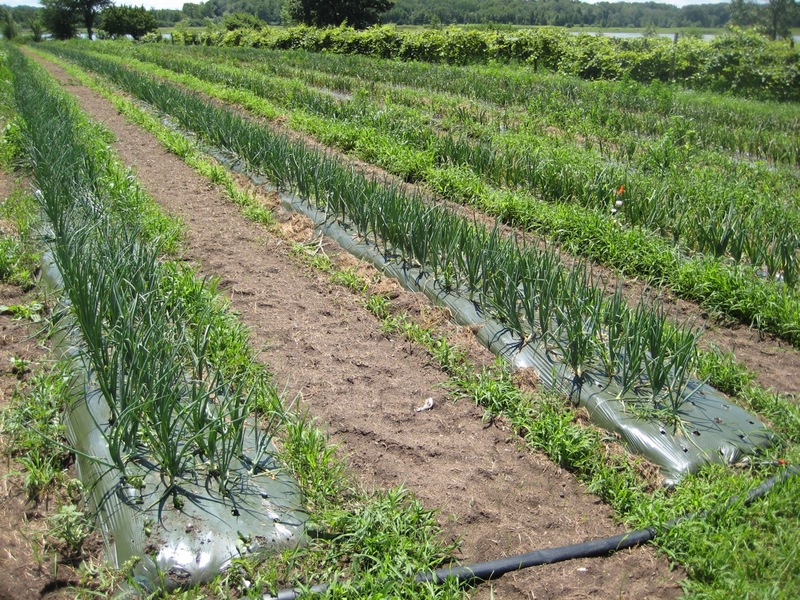 Coleman starts his leek in large 3-inch deep seed flats. He lets them grow until they are at least 10 inches tall. To transplant into the ground, he first digs 9-inch deep, narrow holes with a tool he calls a “dibble,” then drops the leeks in so only 1 inch of the plant is above the surface of the soil. Then there’s no mounding necessary, and he gets beautiful leeks. 3. I’m going to start a gardening calendar here on the blog in the next few days. My plan: record the dates of every garden-related event for the entire year. I hope to experiment with planting and harvest dates year-over-year and develop a better system to maximize my yield from my wee 1/4 acre. I hope you find it [marginally] interesting! 4. I’m going to work on convincing Adam that we absolutely must add at least 4 cold frames. This will probably be about as successful as my work in convincing him that we should get chickens. This book goes on the HIGHLY RECOMMENDED and inspirational list, for sure! Categories: Gardening, Permaculture, Practical, Sustainability, Theoretical, US Food Production, Water/energy efficiency | Tags: book reviews, CSA, green technology, Permaculture | Permalink. 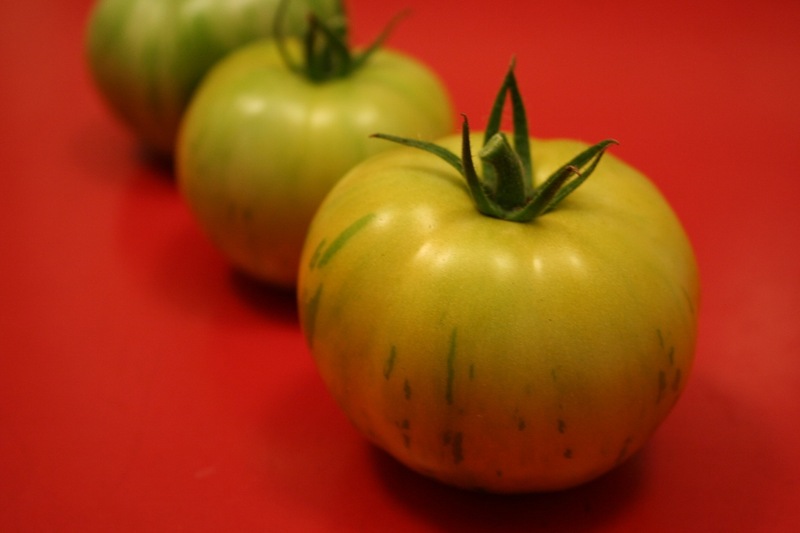 Green zebra tomatoes - a little trickier to know when these are ready! A neighbor asked me recently when was the best time to pick tomatoes. In the past, I always left mine on the plant until they were very ripe. Recently, I’ve been picking them sooner. 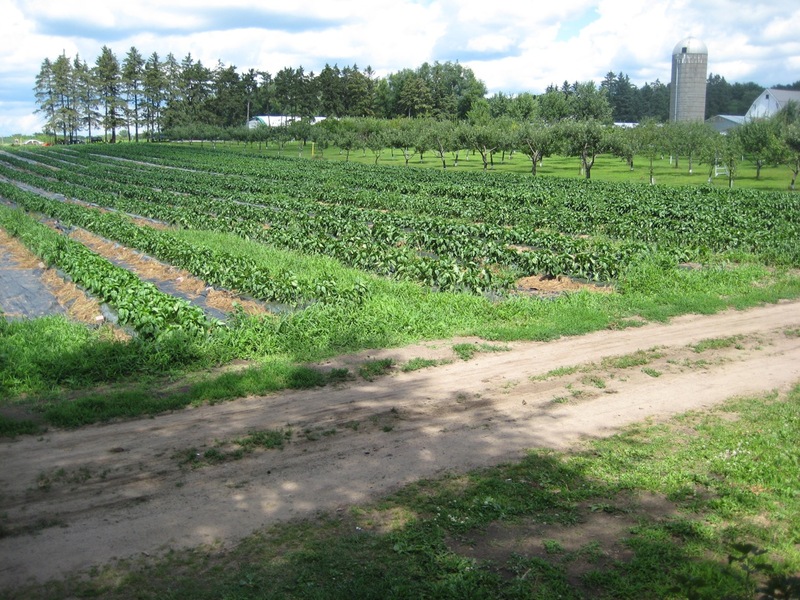 Last year we visited Natura farm and learned that CSA farms pick tomatoes a bit sooner than fully ripe. 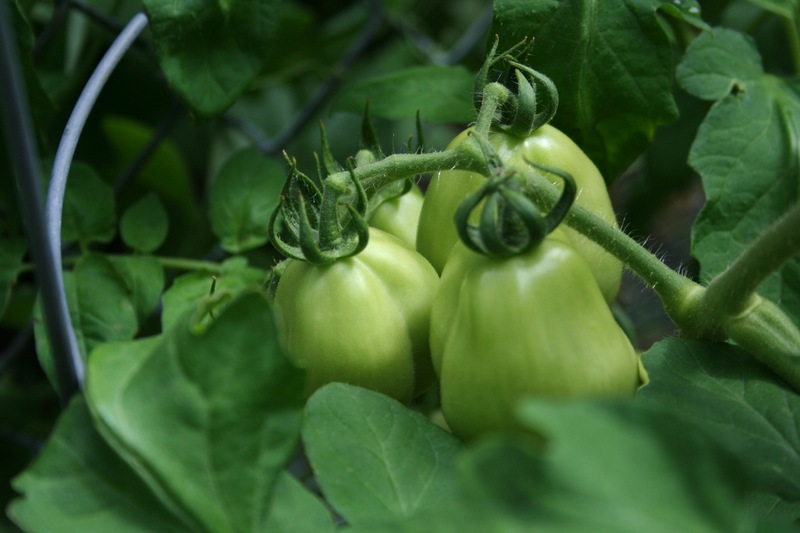 Generally, vine-ripened means the tomato has started to ripen on the vine. This allows growers to ship when the tomato is still somewhat hard, and deliver it to consumers just as it reaches perfection. Makes sense. The farmer I spoke with said there’s little to no difference in flavor between partially vine-ripened and fully vine-ripened. 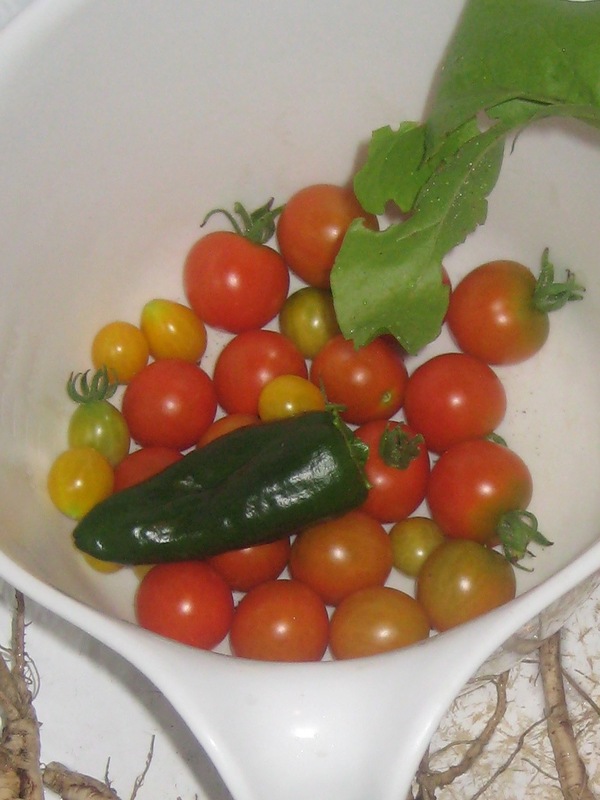 Of course some of these pictured are yellow ‘blondkopfchen’ cherry tomatoes, which often do end up being fully ripe before I pick them because they ripen fast (they get eaten fast, too). If you, like me, are cursed with squirrels eating your tomatoes just as they reach perfection, here’s one solution — pick the tomatoes a few days early and let them ripen on your counter top. Those green zebras at the top were tricky — I’ve never grown them before so I wasn’t sure what their final color actually is (I could have just googled it). But Tracey, you were right: they are absolutely delicious. One final word: never refrigerate tomatoes–home-grown or store-bought. They lose flavor in the fridge. Even the Washington Post agrees with me on this one. Categories: Gardening, Practical | Tags: CSA, tomatoes | Permalink. Once again, I’m hoping to get some trellises built this spring. We actually have a plan and materials on hand this time, so it shouldn’t be a problem. Also: I’m adding some raised beds/very large containers in the backyard that will likely hold a few more veggies such as chard, radishes, and lettuce, and I also plan to construct a potato tower back there somewhere. I will post more about the backyard plans later, as they take shape. I’ve never grown carrots before. Weird, huh? The kids will really get a kick out of them. Expanding the number of herbal tea plants I grow. I’ve become really addicted to peppermint, chamomile, and raspberry leaf teas from my yard. I’m starting my few cabbage and celeriac plants indoors. I tried to do a “scatter planting” of them very early last spring and it didn’t work well at all. It took them forever to sprout, and by that time the bed was full of weeds. Just a mess in general, and I never did see a celeriac. I’d rather set out plants and know what I’m dealing with. I also had to move the cabbages around a lot as they got bigger. The whole thing was really kinda dumb — fortunately I did get several nice heads of cabbage out of it in the end. I’ll start a couple of peppers and tomatoes, but I’m going to buy the rest at the annual Friends School Plant sale, since they usually have a really great selection of both and I’m going to it anyway. Speaking of the Friends Sale, I’m hoping to pick up some native plants and start my evil master plan of converting the boulevard on my entire city block to native grasses and wildflowers instead of boring old grass. Watch out, neighbors. More on that in a future post as well! Update, Feb. 4, 2011: Forgot to note that I’m moving my tomato plants to a new spot this year. I put tomatoes in the same spot for ’09 and ’10, and it was not a good idea. I got very few tomatoes in ’10. 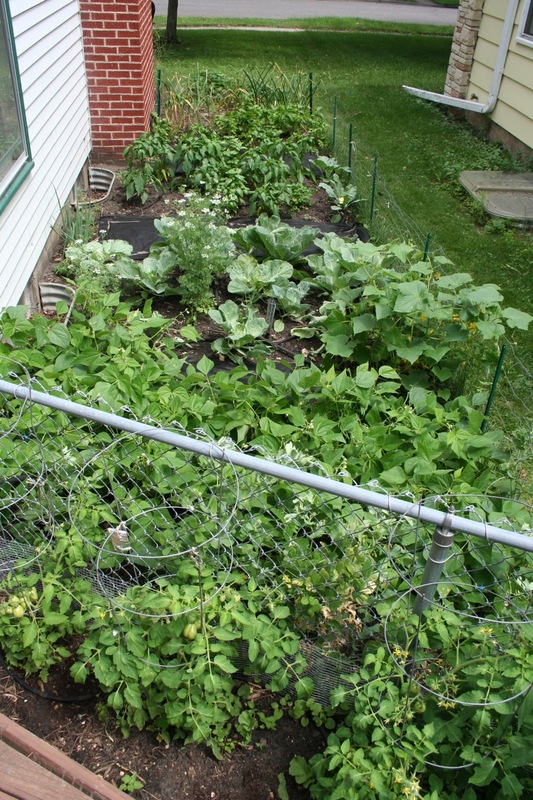 So I’m trying the pumpkins and winter squash and crossing my fingers that the rabbits will not be interested in them (that area is outside the fence). Categories: Gardening, Practical | Tags: beans, CSA, garlic, parsnips, tomatoes | Permalink. Sorry for the light posting schedule lately; as it turns out, having two full-time working adults in a family really cuts into blogging time. ANYWAY. 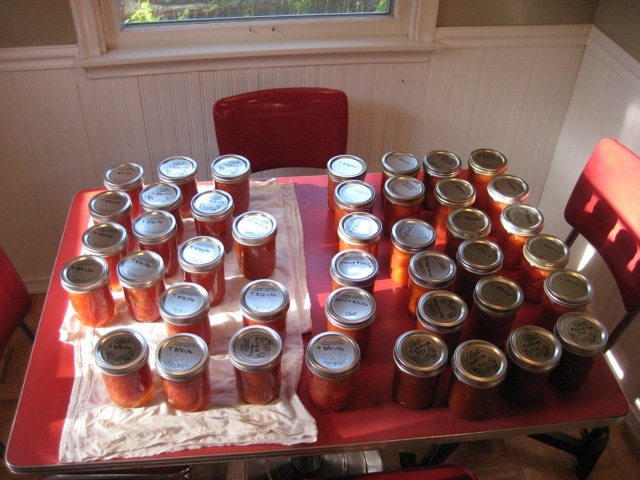 I posted in August about our crazy weekend of canning tomatoes. Because we buy organic tomatoes, and because our CSA delivers them right to our door, we save very little money canning our own tomatoes vs. buying canned tomatoes at the store. So why go through the effort? One reason: BPA. The big brouhaha a couple years back with BPA was its use in infant bottles and linings of infant formula cans — many of those brands now offer BPA-free alternatives. But what many people didn’t realize was just how prevalent this stuff is — nearly any can of food that you buy in the grocery store is lined with BPA. Even store receipts are printed on BPA-coated paper! Here’s another thing to consider: even home-canning is not perfect, because the lids of canning jars are also coated with BPA. But I’m taking a “less harm” approach here — the tomatoes, as they sit on my shelf for the next few months, are not in contact with the lid at all. So it’s not perfect, but still better. Right? I hope so, because that was a lot of work. Update, Nov. 8, 2010: Here’s yet another article that I came across this morning. Basically, a consumer group found unacceptable BPA levels in a bunch of different foods. Two things to note: this article is one year old. The U.S. is still only requiring “voluntary” efforts from the food industry. Update II, Nov. 30, 2010: Now a new study looks at BPA’s effect on adult immune systems. The study also looked at triclosan’s correlation with allergies in children. Triclosan is another common chemical found in all sorts of things (such as anti-microbial soaps). Update III, April 4, 2011: Yet another study. This one measured BPA in people’s urine; after only three days of switching to a diet of freshly-prepared organic food, they dropped 66% on average! 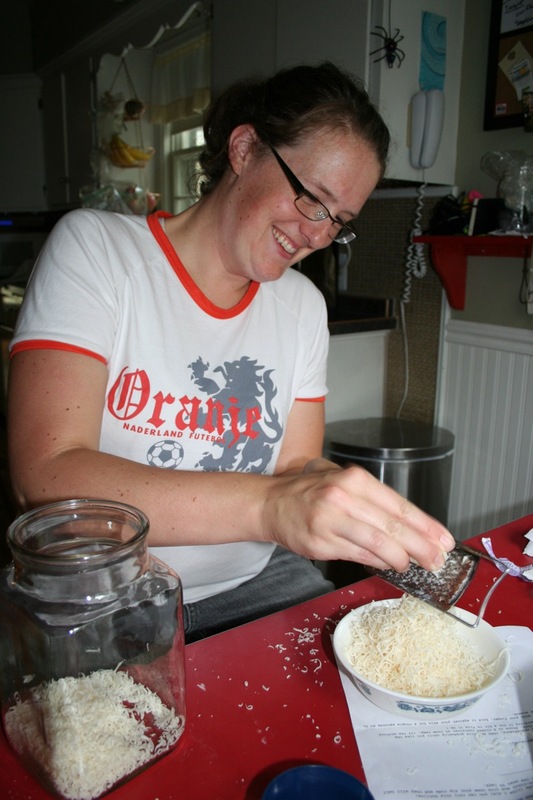 The cooks were instructed to avoid contact with plastic utensils, and nonstick cookware and foods had to be stored in glass containers with BPA-free plastic lids. Researchers even told food preparers not to overfill the containers so the food wouldn’t touch the plastic lid. Microwaving in plastic was out; so was using coffee makers with plastic parts. Coffee drinkers got their morning coffee from French presses or ceramic drip models. I switched to French Press quite some time ago, but didn’t even think about the plastic implications. I did it for the taste, naturally. Anyway, check out this study, the most convincing one yet, in my opinion. Categories: Cooking and baking, Labels, Nutrition, Practical, Theoretical, US Food Production | Tags: BPA, CSA, gettin' groceries, tomatoes | Permalink. 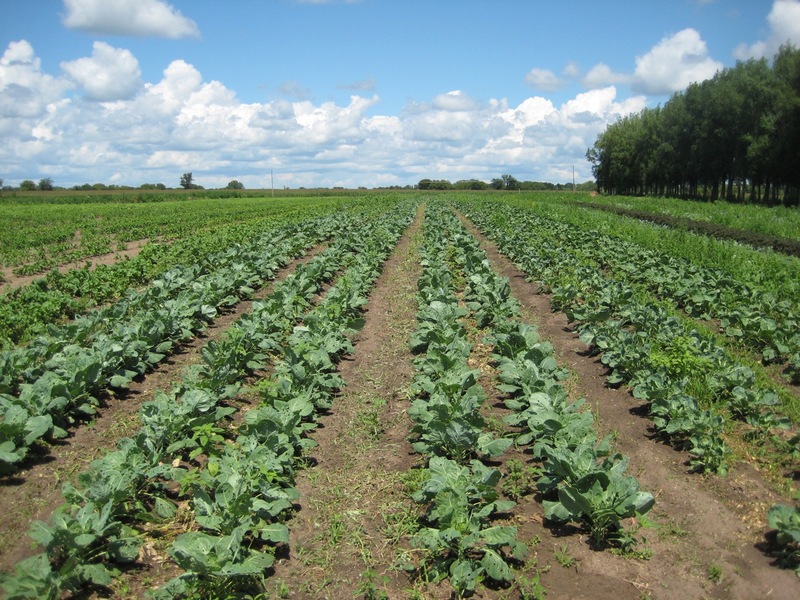 Our CSA share includes two “farm day” events where we can visit one of the farms that we get our produce from, have a potluck picnic and take a tour of the farm (including picking some produce for ourselves). 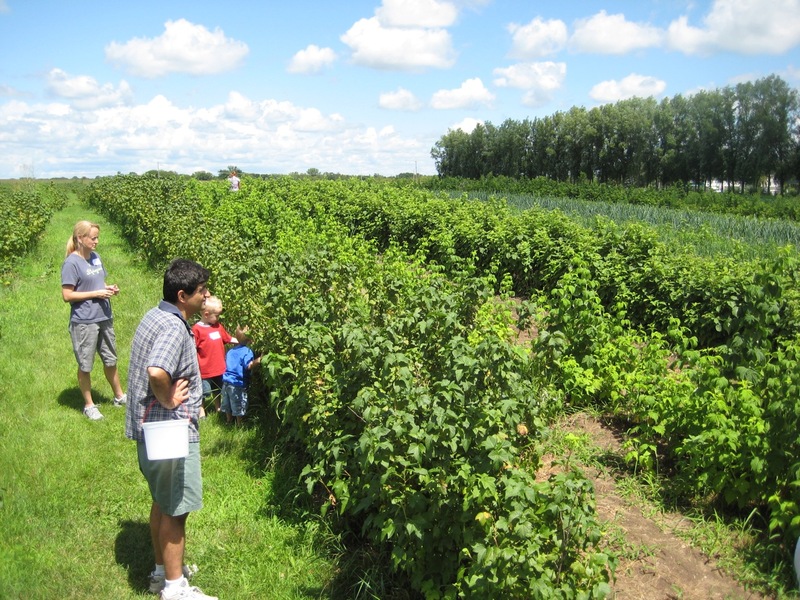 Saturday’s event was at Natura Farms in Scandia, Minnesota. I have never been so excited to be on a farm. It’s small: only 57 acres. This is TINY by today’s standards. Even my Grandpa Rensenbrink’s dairy farm in the 1950s was over 100 acres. 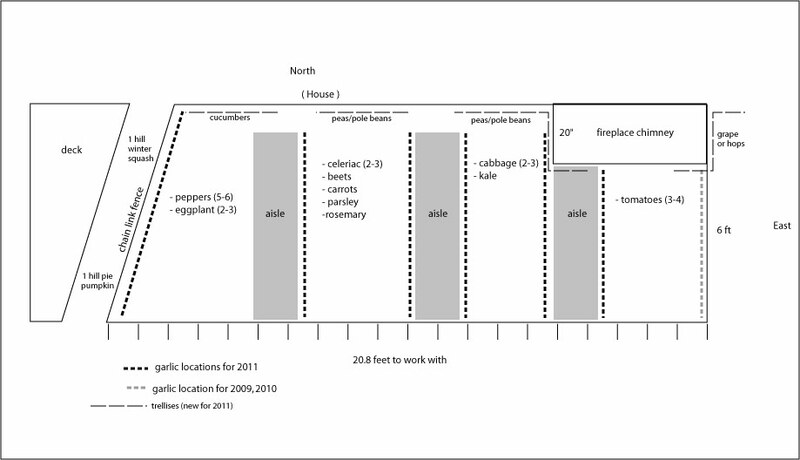 But to see organic vegetable production at this scale totally blew me away, and humbled me (click pictures to enlarge). All the kids in the group got really excited about picking and eating black and red currants — they have A LOT of currant bushes. 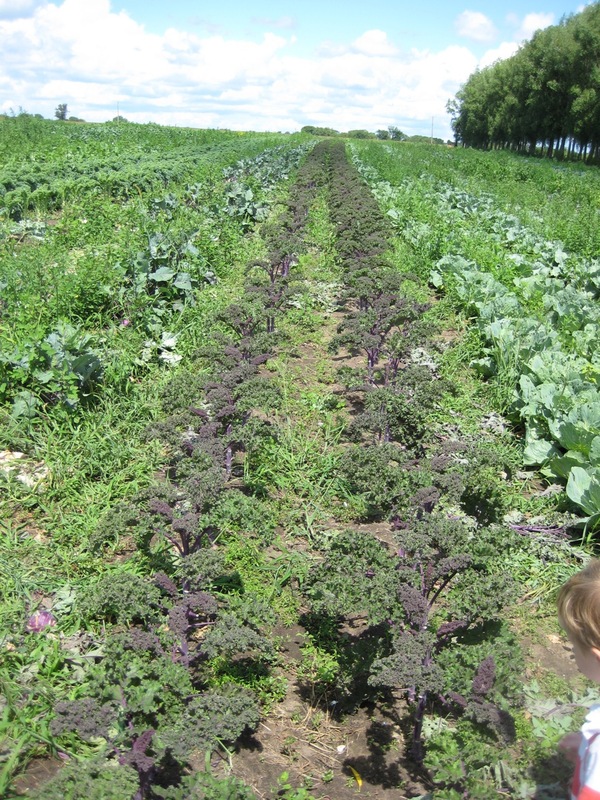 Look at all the kohlrabi! And here’s some kale that could use a bit of weeding. I was a little surprised at how weedy some of the rows were, but honestly, weeds are a fact of organic agriculture — when you’re weeding by hand, and you have this much to do, you’re just not going to hit up every row every day. And weeds can often grow a foot in 2 days. Onions. Some of their crops have plastic mulches for weed control. Paul, the farm manager, explained how some high-quality plastic mulches can be re-used for several years. Makes sense. My personal methods for weed control, including organic mulches like woodchips and straw, are really a lot harder at a large scale. Lots and lots of pepper plants (more than 15 varieties), with apple orchard behind. We’ve doubled the organic matter in the soil and more than doubled the depth of our topsoil. 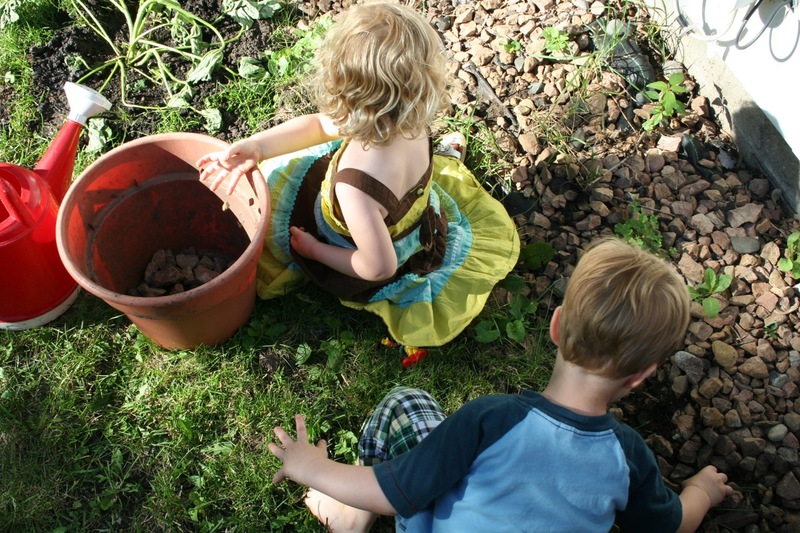 Earthworms love our rich soil – you can literary smell the life in it instead of petrochemical toxins. 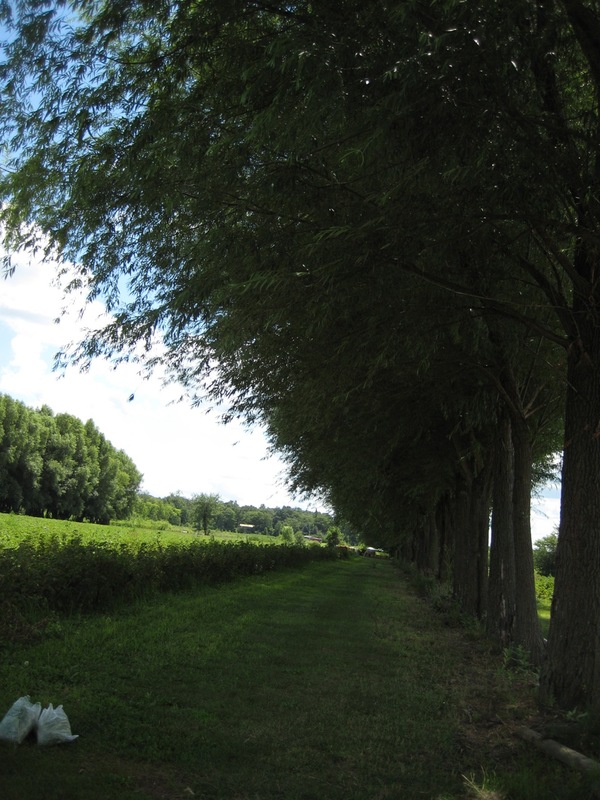 We’ve practically eliminated soil erosion by wind or water. Elevated organic matter, a multitude of windbreaks and grass middles between rows of berries, grapes and apple trees all help us achieve healthy soil. My favorite part was when Paul mentioned that one of his favorite fertilizers is diluted molasses. He mixes molasses, fish emulsion, and other minerals into water to feed his plants. I don’t use liquid fertilizer in my garden, but once again on this scale I can see where it’s necessary. Sounds good to me. I loved this place. Categories: Gardening, Practical, Sustainability, Theoretical, US Food Production | Tags: CSA | Permalink. 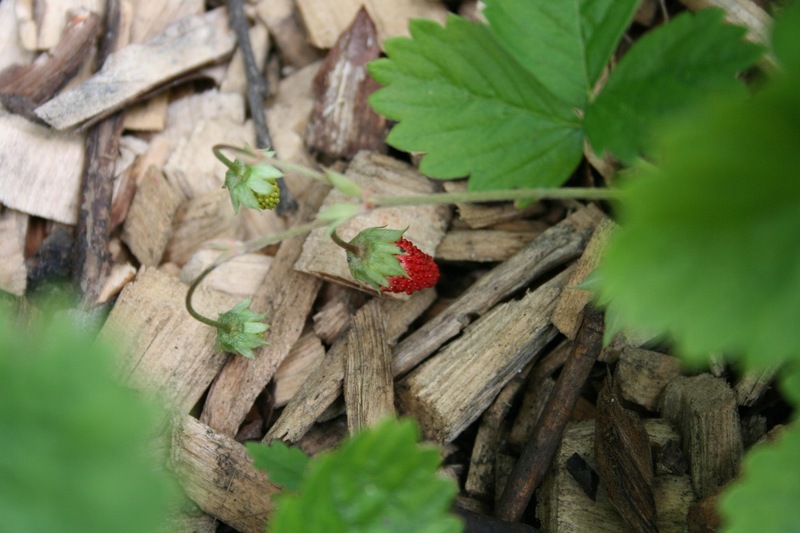 The alpine strawberries that I planted this spring are producing some fruit already. They do taste pretty amazing — a very full, sweet strawberry flavor in a tiny size. What I’ve read elsewhere is definitely true: they are shade-tolerant, but the more sun they get the more fruit they produce. So, I wouldn’t bother with them in heavy shade. Part shade is just fine. 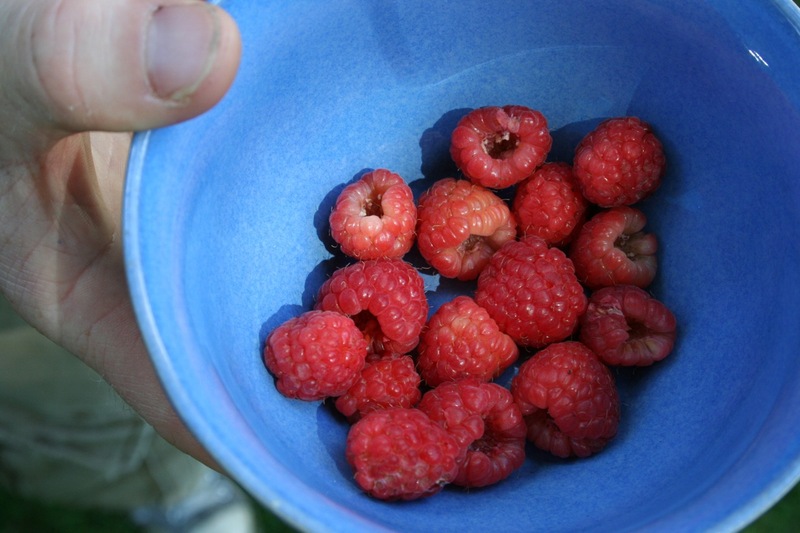 Raspberry season has officially started. This was our first picking, last week. This was our picking today. 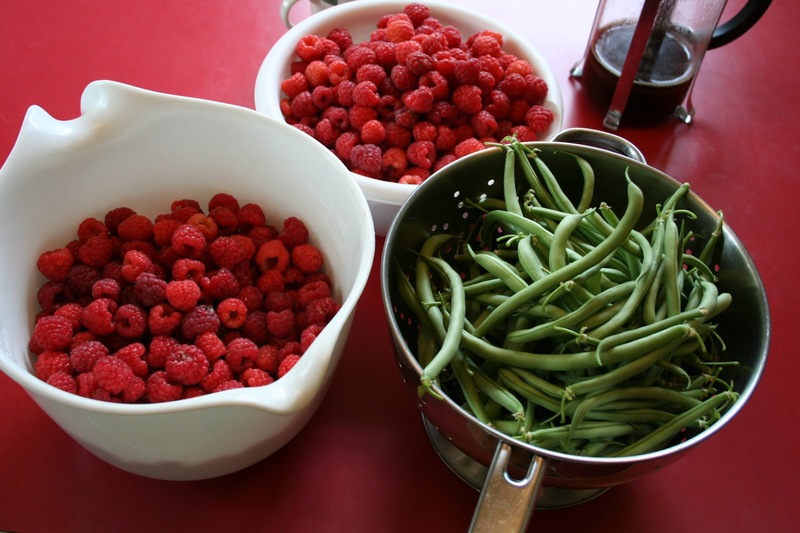 We are getting a ton of berries & green beans are ready now too. We’ve frozen five quarts of raspberries so far, and are eating a good quart of them every day too. 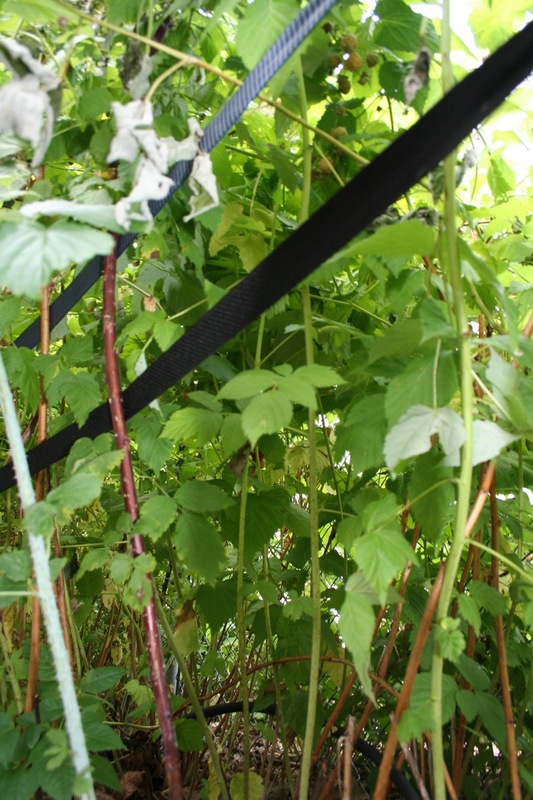 I took this picture of the underside of our raspberry hedge to illustrate how raspberries (the old-fashioned cane variety, anyway) work: the darker woody canes are the ones that sprouted last year. Right now they are fruiting, and then they will die. The green canes will overwinter and produce fruit next year. I remove the woody canes shortly after the fruit is gone. 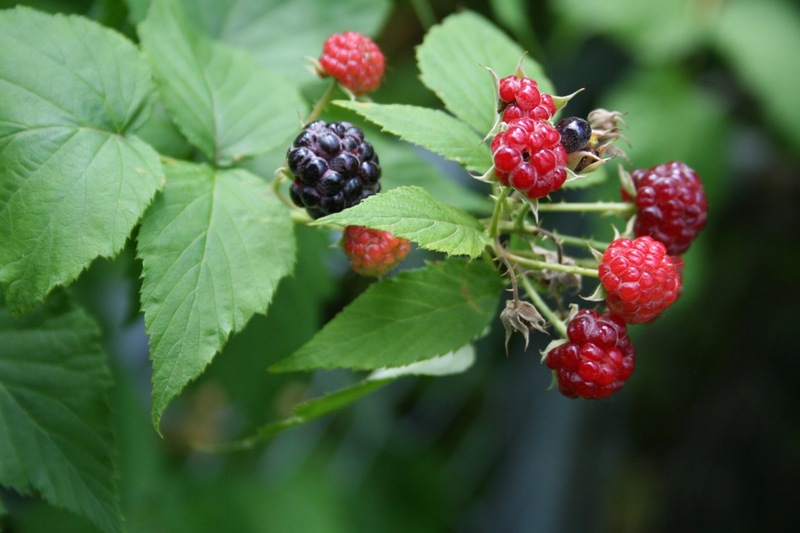 A handful of our raspberry plants are actually black raspberries. They start out small and red and then get darker as the fruit swells (standard red ones start out light pink). Wow, these are absolutely delicious, a little bit sweeter than the reds. 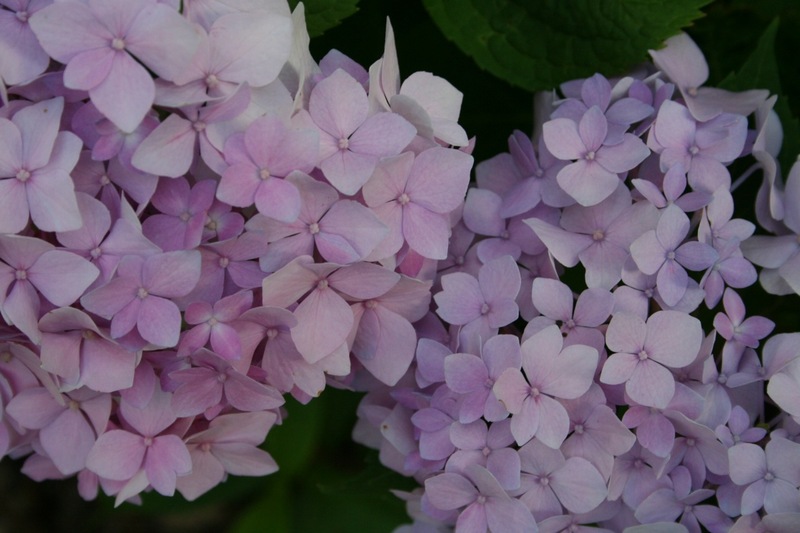 My efforts at acidifying the soil around my Endless Summer hydrangea (in order to make the flowers blue) have given me a plant with some pink flowers and some purple. It’s kinda pretty actually: like a natural gradient. 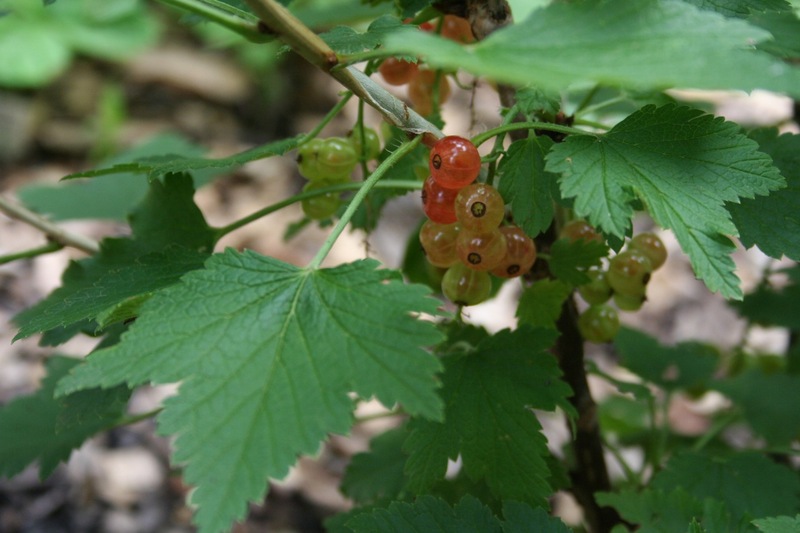 My new red lake currant bush also has some berries. 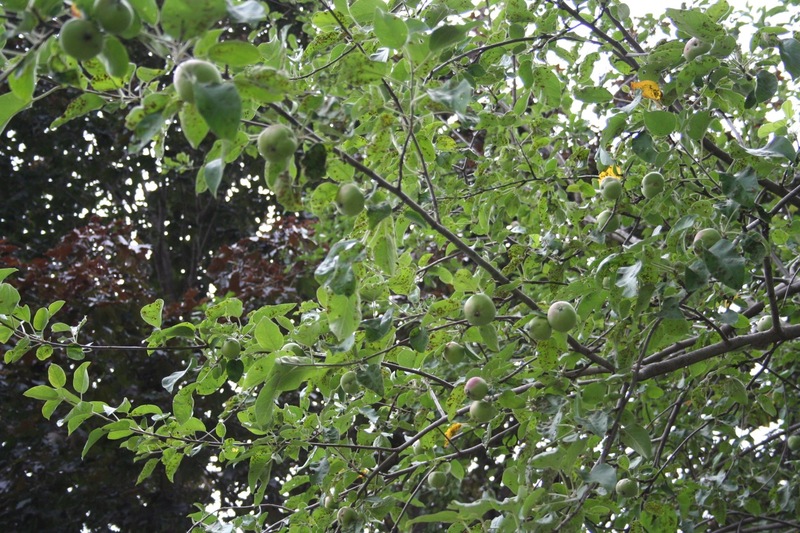 Here’s my sad apple tree. It has so many diseases/infestations at this point that I’m having trouble figuring out which one is afflicting it most. I don’t think last year’s pruning solved the fire blight problem. We will most likely have to remove this tree next year, but we want to at least see how it does this year. It’s got quite a few apples on. Moving on to the vegetables, 2 inches of rain last week plus lots of sunshine this week made for some very happy veggies. Everything is around two weeks ahead of schedule. Garlic will be ready to harvest soon. I will pull one later this week and see how it looks. Banana peppers, italian flat-leaf parsley, cauliflower and a small creeping charlie weed (whoops) all co-existing peacefully. 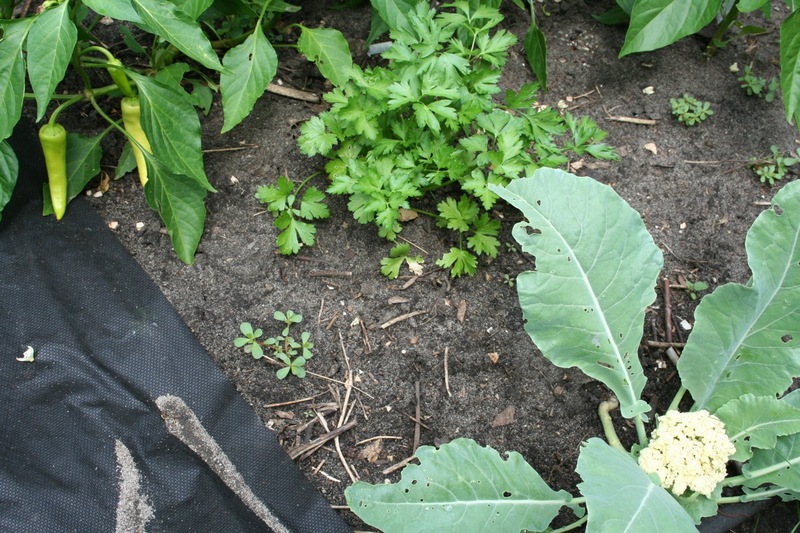 My mistake cilantro looks quite nice next to the cabbages, and it’s attracting a lot of bees to the garden. I’m leaving it in for now. Cucumbers! The plants are full of blossoms and a couple of baby pickles. 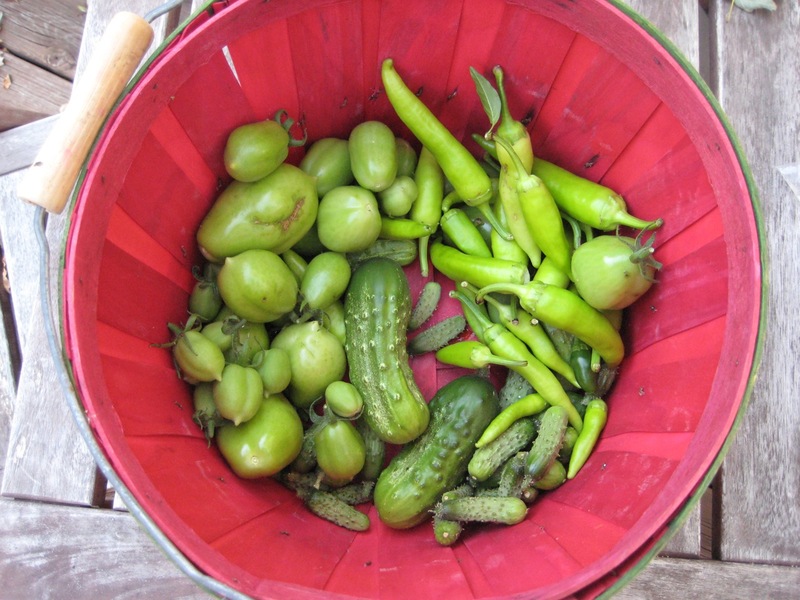 I can’t wait to start pickling. Lots of wee roma tomatoes on the vine. I planted all romas this year in the hopes of having enough to can some of my own. I doubt I’ll get that many, but I can add these to the ones I plan to buy (I bought a 20 lb crate of romas last year through our CSA and plan to do so again). We FINALLY came up with a plan for the backyard garden! We were going to put one in this spring, but we got overwhelmed with other things, and we just never came up with a solid plan that we both like — we have a tentative plan now which I will post about soon. We’re getting started on some of the preliminaries now, even though we won’t actually plant it until next spring. First up: getting rid of the landscape rock next to the foundation. 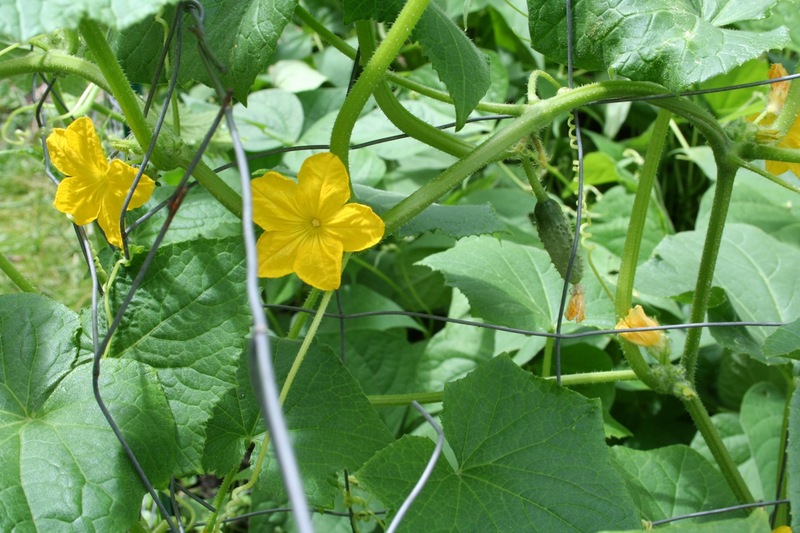 Categories: Gardening, Practical | Tags: apples, beans, CSA, raspberries, tomatoes | Permalink.